Thanks to you, your financial support and your prayers, our mission’s labor continues. Like many of our friends, we are just barely getting by right now, squeezing pennies. The need for our work is as great as ever, beaming the Mass and the Rosary into remote villages that rarely, or in most cases, never, see a priest. Providing education and encouragement, discussion forums for a wide range of important topics. Providing encouragement, positive companionship and inspiration. Your gifts and prayers make all of this possible. Thank you so very, very much for helping what we believe is the most honored radio station in North America in a place where the many benefits its signal provides are so greatly needed. NOT “ARF” BAD! 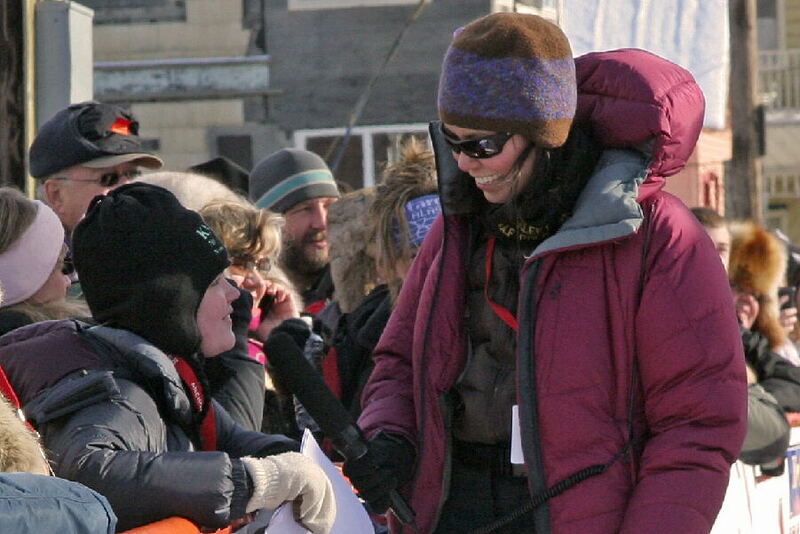 (left) In fact, KNOM news director Laureli Kinneen’s reporting on the Iditarod Race this year was extraordinary. 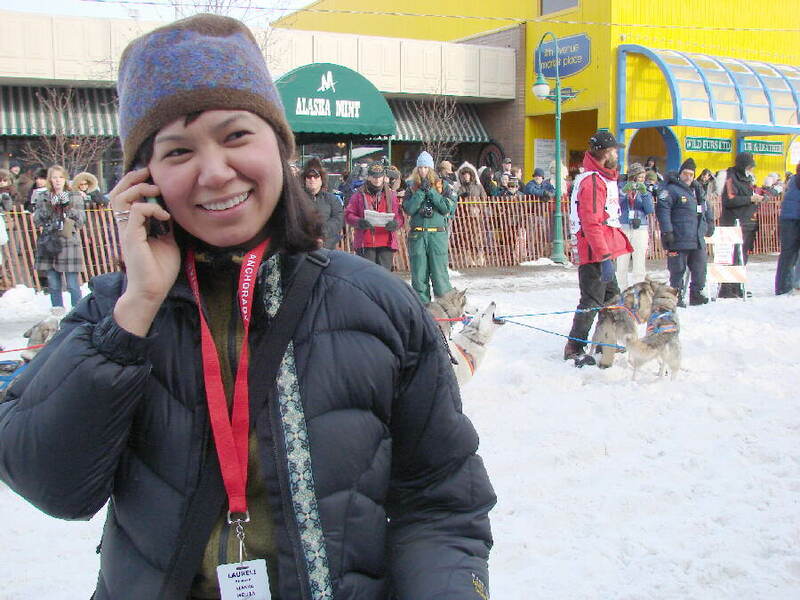 Here, she’s reporting by cell phone, live on the air from the middle of 4th Avenue in Anchorage as a team waits to approach the finish line. As you can see from the dog behind her shoulder, they can’t wait! This was the 38th Iditarod. 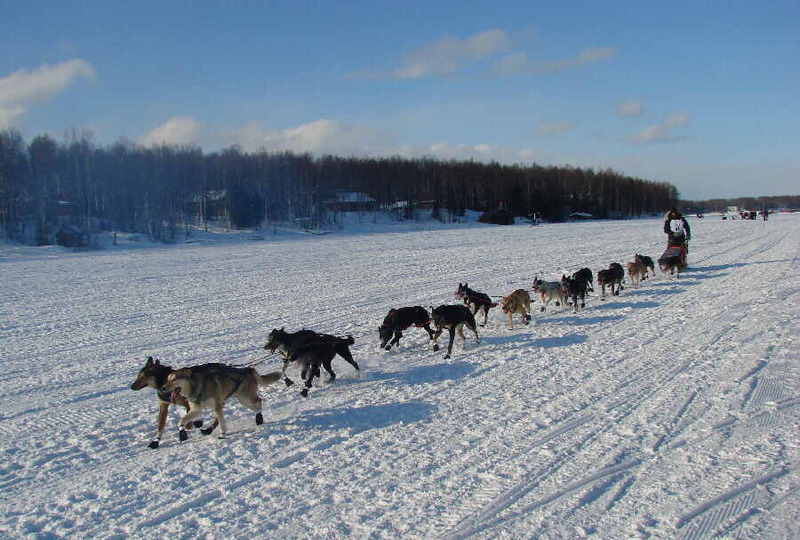 Why would a Catholic radio station cover a sled dog race? The answer is twofold. Second, our remote listeners request it, and thank us for it. All expenses are paid by businesses, for which we broadcast underwriting announcements, like the ones you hear on public radio stations. (Left) Eventual winner Lance Mackey, driving along a lake about eight miles from the start of the race at Willow, Alaska, north of Anchorage. 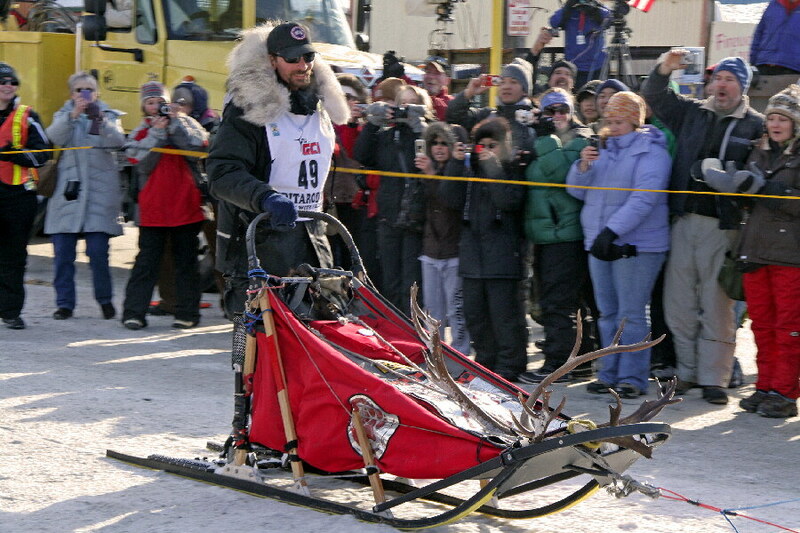 (Left) Mackey at the Nome finish line, 1,000 miles later, greeted by an enthusiastic crowd. (Left) KNOM news director Laureli Kinneen co-anchors the finish with volunteer news director Leah Radde. 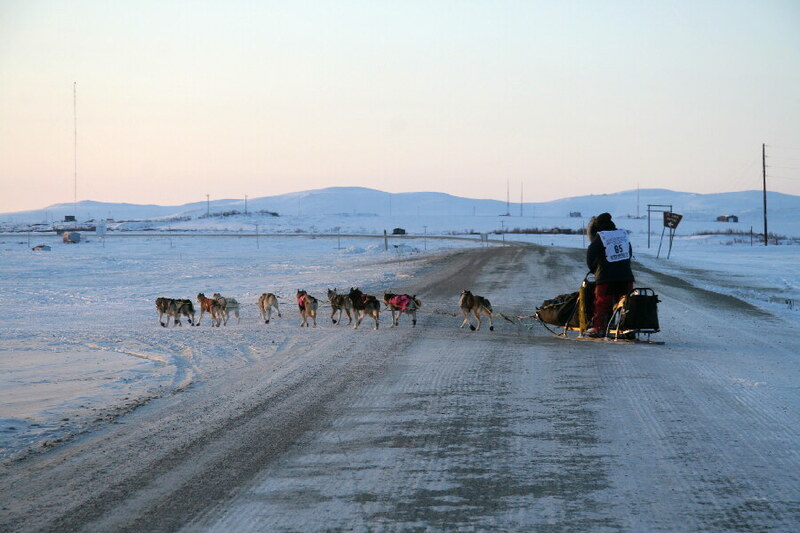 (Left) Iditarod competitor Bruce Linton crosses the gravel highway and descends to the mouth of the Nome River, about 3-1/2 miles from the downtown Nome finish line. Linton finished 25, about a day and a half behind winner Lance Mackey. At left in the distance, you can see the KNOM transmitter. Unlike many Iditarods, the weather is sunny and relatively warm, just above zero. GOOD NEWS! According to the Department of Health and Social Services, Fetal Alcohol Syndrome (FAS), long a plague in this region, is down 32%, a significant reduction. Eliminating FAS has been a goal of our mission for many years. You can take partial credit for this improvement! INSPIRATIONAL SPOT: I am only one, but still I am one. I cannot do everything, but still I can do something. Because I cannot do everything, I will not refuse to do something that I can do. 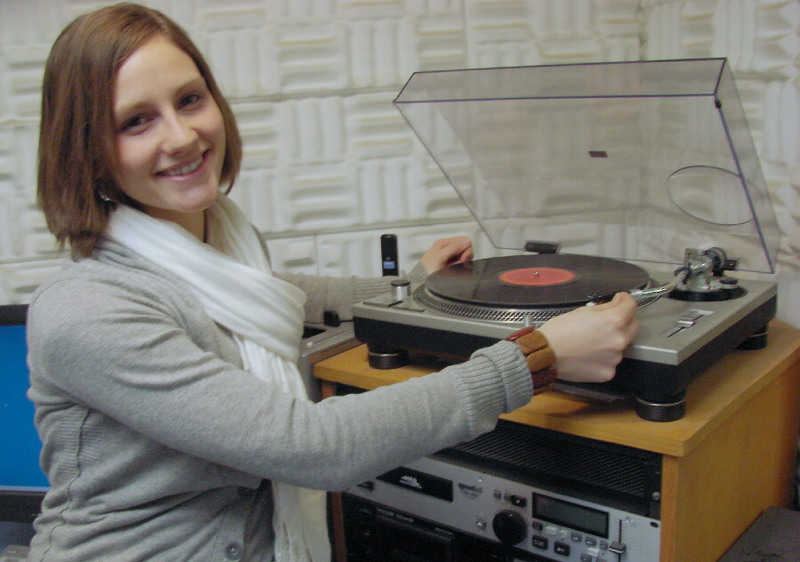 GOING FOR THE RECORD: (left) KNOM volunteer inspiration director Danielle Sylvestor plays an LP in Studio B. While most of our music is in the form of files on computer drives or from a compact disc here and there, you will occasionally hear a particularly rare song played from a 33 or 45 RPM platter. As we promised last month, this picture was taken of Danielle after she had donated ten inches of hair to a group that produces wigs for people in cancer treatment. “What’s the album?” you might ask. It’s Johnny Cash’s greatest hits. Danielle is a fan. CULTURE SHOCK: That’s what happened to Alaska Natives when gold miners, then missionaries, arrived more than a century ago. Since its inception, an objective of the KNOM mission has been to help heal this hurt, encourage pride in the rich Native cultures and help preserve their languages, their music, their art and oral literature. That’s why, for almost forty years, we have broadcast “Eskimo Stories and Legends,” traditional tales from ancient times, passed orally from one generation to the next. Just over six years ago, we premiered the monthly “Elder Voices,” a half-hour program featuring an older person from Nome or a village talking about what’s important to them. Some of these folks cannot speak English, and the show is presented in their language with translations. It’s been at least thirty years since our library of Inupiat (in-OOO-pee-at, northern), Yup’ik (YOO-pick, southern) and Siberian Yupik (St. Lawrence Island and the Russian coast) songs was large enough that we could play one selection every hour. 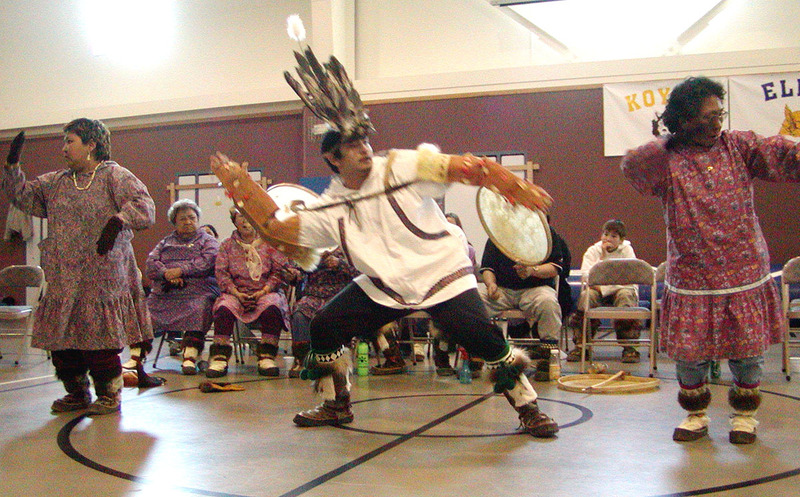 (Left) The King Island Singers and Dancers perform their traditional Eagle-Wolf Dance in this 2003 KNOM photo from the village of Wales. KNOM’s growing collection of Native music now includes 616 performances, most of them recorded by the station. It’s impossible for us to thank you enough for helping provide our isolated listeners this kind of programming. LEGACY: Please consider adding the KNOM radio mission to your will. Several of the KNOM staff have. For most of us, a bequest will be largest gift we will ever make, and we pledge to you that we prayerfully place all such gifts into funds that will provide for future major improvements, and will help the mission survive during unforeseen emergencies. INSPIRATIONAL SPOT: You cannot repent too soon, for you don’t know how soon may be too late. 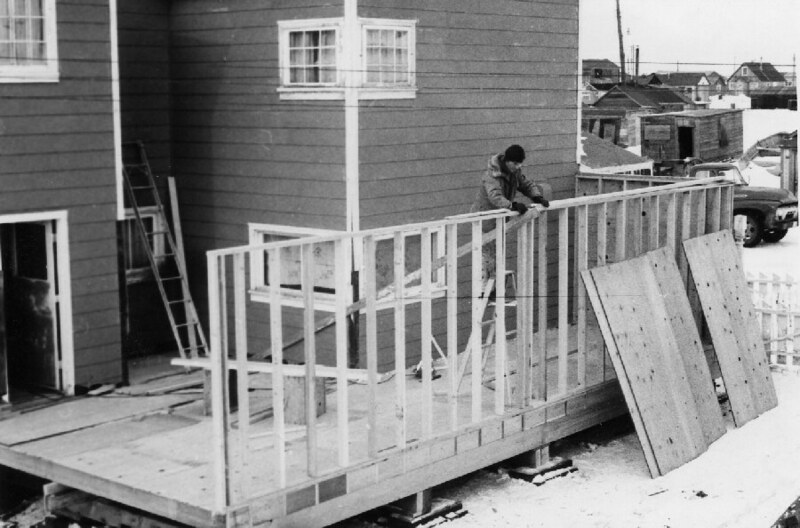 HARD AT WORK: (left) General manager Ric Schmidt shovels the steps of the KNOM AM transmitter building, located on tundra at the Nome River mouth, about three miles east of Nome. This March day is relatively balmy, about zero degrees. It’s a great improvement from the day before, when the temperature was –25� with winds at the site probably at hurricane force. It is an extremely windy location where winter weather conditions are often life-threatening. A week later, it was –25 again. 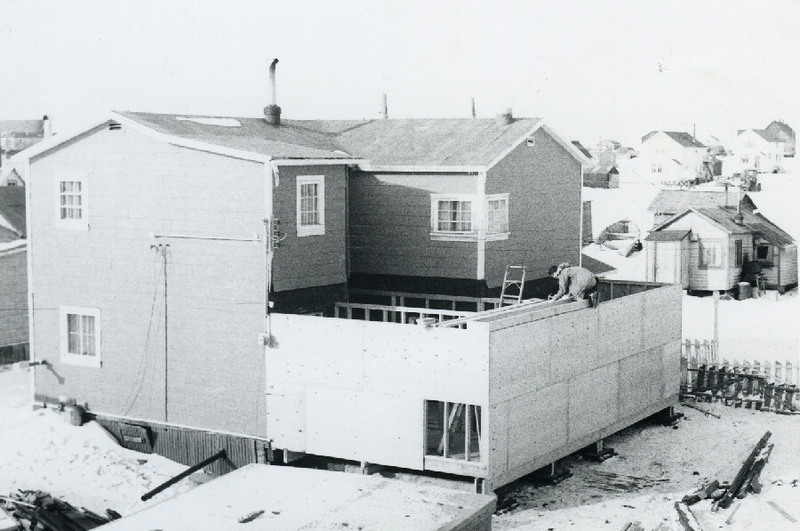 Since the very beginning of the mission project in 1966, KNOM staff from the top down have shared all ice and snow clearing and janitorial work. LIGHT SUBJECT: After April 9, Nome residents will not see true darkness again until September 3. The first few days the arctic effect is hardly noticeable, but by the third week of the month, it will be obvious. By mid-May, the midnight sky can be bright enough for you to read without a lamp. On average, KNOM broadcasts about 34,000 educational spots every year, as well as 34,000 inspirational ones. Thank you for helping make this valuable service possible! NEWS: In addition to what you’d consider local headline news, the KNOM news department also focuses on important local issues. In the past month, stories and interviews have dealt with wind power, voting rights, tribal lands, high fuel prices, the funding of bush schools, subsistence fishing, illegal drugs, pre-college programs, mining, salmon research, hazardous waste, utilities’ issues and village relocation. INSPIRATIONAL SPOT: What is talent but originality robed in resourcefulness. What is success, but effort draped in determination. What is achievement, but a dream dressed in work clothes. What is accomplishment, but ability stripped of its doubts. What is life, but a series of opportunities masked as difficulties. 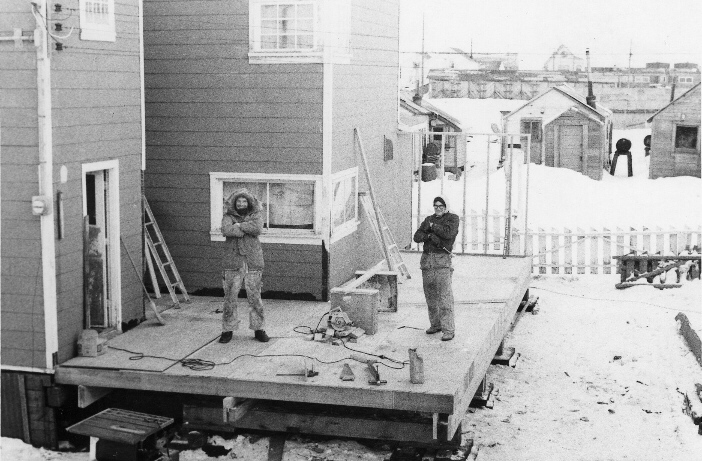 FORTY YEARS AGO: (Left) In April 1970, volunteer carpenters Tom Karlin, at left, and Leigh Birkeland begin work on an addition for the Catholic radio project’s studio building. 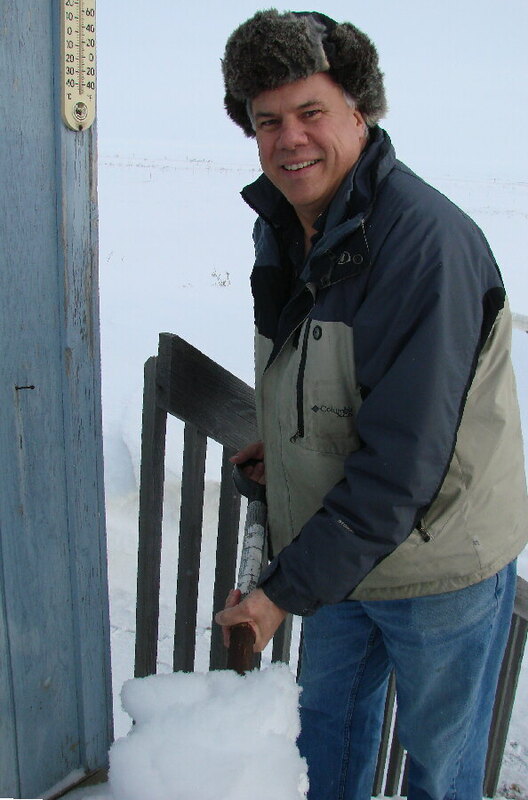 There’s little snow that winter, but it’s cold, and for many April days, work has to be suspended, as nails will not penetrate into wood at temperatures colder than –30� F.
Still, the Federal Communications Commission is silent on when the agency might grant permission for purchase and installation of equipment. TWENTY YEARS AGO: Washington, DC attorney Joseph Hennessey has helped KNOM for 22 years at no cost. In April 1990, his law firm is dissolved. KNOM accepts a generous standing offer from attorney Lee Knauer, a KNOM contributor whose prestigious firm Wilkinson, Barker, Knauer & Quinn assumes the donation of future legal work. Also in April 1990, Alaska Press Women fly general manager Tom Busch to Anchorage to be the keynote speaker at their convention. Tom gives a thirty-minute talk on the KNOM mission and the importance of women in its history. They cringe when he tells them that in 1972, the station received phone calls saying “get those women off the air and back into the kitchen,” but loudly applaud when they hear that just two years later, KNOM had helped change old attitudes and a woman announcer was among the station’s most popular. YOU ARE AN ANGEL for our mission, and you’ll be happy to know that in Nome, there are good people who also look out for us. Last month, with the mercury in double digits below zero, the furnace in our volunteer dormitory quit. A man named Marty Ruud, who has been a friend for many years, dropped everything and devoted a few hours toward its repair. Marty is in the furnace repair business, and in Nome, where the cost of living is double that of the Lower 48, we were worried about the size of the bill. What did Marty charge? $114. We think he only billed us for the parts. Thank you, Marty! AS ALWAYS, you and your intentions remain in our daily prayers, and we formally pray for you at each weekly staff meeting. Your gifts, your concern for us and the widely scattered, mostly impoverished people we serve, your prayers—words have not been invented that could truly express how grateful we are to you. Our prayer for you is that Our Heavenly Father grants you peace and that He bestows upon you and those you love every blessing. Thank you so much, once again, and may God greatly bless you.